New images obtained on May 16, 2016, by NASA’s Hubble Space Telescope confirm the presence of a dark vortex in the atmosphere of Neptune. Though similar features were seen during the Voyager 2 flyby of Neptune in 1989 and by the Hubble Space Telescope in 1994, this vortex is the first one observed on Neptune in the 21st century. Neptune’s dark vortices are high-pressure systems and are usually accompanied by bright “companion clouds,” which are also now visible on the distant planet. The bright clouds form when the flow of ambient air is perturbed and diverted upward over the dark vortex, causing gases to likely freeze into methane ice crystals. 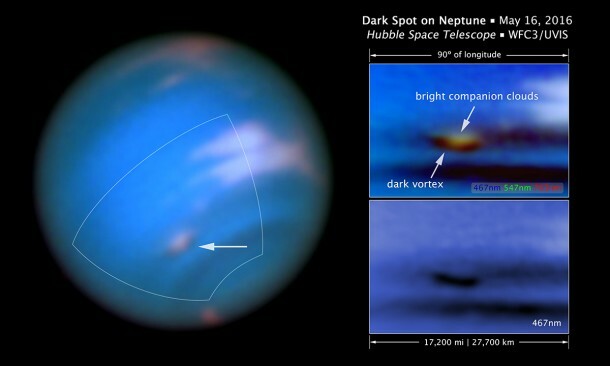 Beginning in July 2015, bright clouds were again seen on Neptune by several observers, from amateurs to astronomers at the W. M. Keck Observatory in Hawaii. Astronomers suspected that these clouds might be bright companion clouds following an unseen dark vortex. Neptune’s dark vortices are typically only seen at blue wavelengths, and only Hubble has the high resolution required for seeing them on distant Neptune. Neptune’s dark vortices have exhibited surprising diversity over the years, in terms of size, shape, and stability (they meander in latitude, and sometimes speed up or slow down). They also come and go on much shorter timescales compared to similar anticyclones seen on Jupiter; large storms on Jupiter evolve over decades. Planetary astronomers hope to better understand how dark vortices originate, what controls their drifts and oscillations, how they interact with the environment, and how they eventually dissipate, according to UC Berkeley doctoral student Joshua Tollefson, who was recently awarded a prestigious NASA Earth and Space Science Fellowship to study Neptune’s atmosphere. Measuring the evolution of the new dark vortex will extend knowledge of both the dark vortices themselves, as well as the structure and dynamics of the surrounding atmosphere.